Turtles don’t have teeth. Neither do tortoises or terrapins. Their powerful and oddly-shaped beaks tell us a lot about what they eat. Some turtles—like green sea turtles—have serrated ridges along the inside of their beaks that simulate teeth. They use these sharp edges to tear sea grasses apart and scrape algae off of hard surfaces in the ocean. Omnivorous species—such as Loggerhead turtles—have powerful jaws, so they can crush hard-shelled species. Other omnivorous turtle species such as the Leatherback turtle have a sharp, pointy beak that allows them to hold onto to slippery prey such as jellyfish. One of the most common turtles in North America, snapping turtles, are known for being voracious eaters of small mammals such as ducks and mice. As with most turtles, their diet consists mainly of plant based foods. Snapping turtles usually won’t bite humans, but if given the opportunity, they may bite your hand or foot. 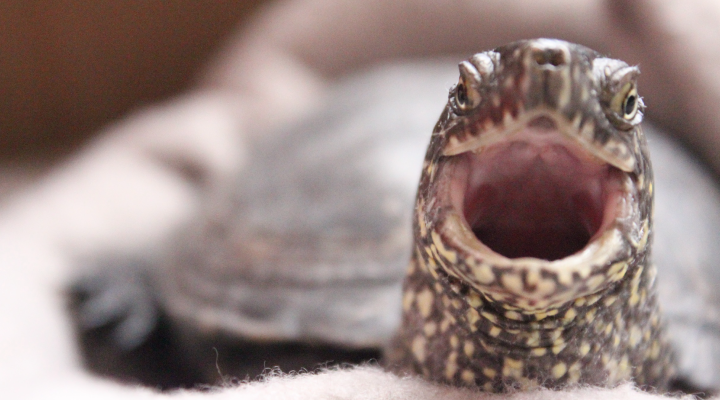 Though turtles don’t technically have teeth, their jaws and beaks serve as an effective replacement.